If you don’t have anything special planned for Father’s Day (this Sunday!) then here is your answer. 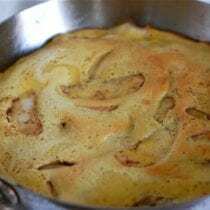 This simple whole-wheat German “oven pancake” can easily be passed off as a breakfast, snack, or even a dessert dish (especially if you top it with homemade ice cream…yum). Both the apple and pear suggested below go really well with the flavors, but don’t be afraid to experiment with other fruits like bananas, raisins, or blueberries depending on what you have on hand. Core and slice both the apple and pear (you can leave the peel on) into pieces between ¼” and ½” thick, set aside. In a blender combine the eggs, vanilla, honey, flour, baking powder and salt. Blend until smooth, about 10 – 15 seconds. Heat the butter in an ovenproof sauté pan over medium heat. Add the sliced pears and apples and cook for about 5 minutes or until soft. Sprinkle the fruit with cinnamon and remaining teaspoon of honey then toss to combine. Spread fruit evenly across bottom of pan and pour batter over top. Cook for about 4 - 5 minutes over medium-low heat until the bottom is set. Transfer to oven and bake until top is golden brown, about 6 – 8 minutes. Put a large round platter upside down over the top of pan and then flip over together with pan. The pancake should come out clean onto the platter. Slice, eat, and enjoy! Previous Post: « Food Babe Investigates: Is Subway Real Food? My family loves these. I usually make ours with apples, but last summer I used fresh picked huckleberries and it was fantastic! LOVE doTERRA! I’m saving my pennies for the Family Physician Kit! We use the melaleuca (canker sores and sunburns thus far), clove oil (numbing agent!) and the lavender (goodbye allergies and anxiety!) thus far. I’m curious what from melaleuca you use for canker sores. Suffer from those in our family! Thanks! Melaleuca is the name of one of doTERRA’s essential oils! It is AWESOME for canker sores! I highly recommend trying Young Living Essential Oils. They are theraputic-grade, which is something other oil companies can usually claim. Since I started using them I have literally thrown out every type of medication and cleaning supply in our house! I now make everything thing myself and turn to them whenver anyone in our house has an ailment! They are by far the most amazing product I have EVER used!!! I LOVE doTERRA’s essential oils!!! :-) I’ve smelled other E. O. Companies and they have a chemical smell to them. DoTERRA’s oils are pure. They actually have a 3rd party test them to make sure they have all of the correct components that that specific plant is supposed to have. And definitely NO pesticides. :-) I have used the oils on my whole family including my baby and have had amazing results! The oils are actually effective against Bacteria and Viruses. For those that don’t know much about essential oils, they are natural extracts from the seeds, stems, roots, flowers, bark and other parts of plants. They truly are a gift from our creater and I am so happy to know about them! I love doTERRA oils! They are amazing and good quality. Some people kind of go crazy at the price but they really do last a long time. A little goes a long way. Very good product! We make something like this almost every weekend. Our ratio & method are a little different, though. Whisk together first the flour into the milk (and salt), then the eggs. You could use a blender, but this takes less time than it takes me to clean my blender so I use a whisk. Swirl 1.5-2 Tbsp butter in the hot pan to coat, then pour in batter. Bake for 20 minutes, reduce temp to 350 and bake 5 minutes longer. Alterations: saute apples, pears, or hard persimmons with cinnamon and butter/oil in a separate pan and artfully arrange on top of the batter before putting in the oven. Or, make it savory and add cooked sausage, leftover taco meat, sauteed mushrooms and onions, etc. in the same way (I think it helps it stick less if you drop the additions on top of the batter instead of vice versa, but maybe that’s just my pan). If served without alternations, it’s really good with lemon juice squeezed on top (I grew up with lemon & powdered sugar, but I’ve discovered just lemon is good too), or fresh fruit, or freshly made berry compote (frozen berries simmered until they start to fall apart a little). Hello Lisa, I love your recipes! I will surely be making this for my husband on father’s day. I was wondering if you had any tips on using stainless steel pans. I noticed you use them even for crepes. I have a cuisinart brand and it often sticks all the food I cook, even eggs. It’s probably just me not knowing how to use it properly and not the pan itself. Any ideas? Thank you! I love DoTERRA essential oils! I mix a drop of wild orange or Citrus Bliss with jojoba oil as a moisturizer and it makes me feel so happy! I also have samples of the lavender, melaleuca and lemon that I’ve been using for various things. I love the Terra Shield for bugs- it works well and smells soooo good. I’m very pleased with the On Guard concentrated cleaning liquid I purchased to try. I make all of my cleaning products, but wanted to give this a try to see how far it will stretch. Love how it works! I’ve found I don’t need any baking powder to scrub out the bathroom sinks, the spray is enough. I was skeptical because of the price, but I’m a believer. And a little really does go a long way. Anyone suggestions on how to make this gluten free? My daughter was on a GF diet for awhile and I got Pamela’s Bread Mix and Flour Blend and substituted it for regular flour and the results were good every time I used it. It doesn’t fit with the “real food” rules because it has white rice flour, evaporated cane sugar, etc., but it’s a lot closer than buying the pre-made GF breads that were really dry and crumbly. I got it at my local grocery store, but Amazon has it in bulk for a good price too. I have been wanting to try Almond flour. Do you substitute it 1:1? Yum!!! I hate to ask bc u already do so much, but… are any new weekly meal plans on the works? I am addicted to them! They make my life so easy!!! Thank you! Made this today and it was great! Unfortunately, my kids won’t eat fruit if it’s mixed with anything (i.e. blueberry pancakes), but they still ate the pancake part. Thanks for sharing your insight and recipes â€“ so very appreciated!! There’s supposed to be milk in this recipe, right? Is it better to purchase “Multigrain” English Muffins or “Whole-Grain” English muffins? The “Mulitigrain” Muffins have 8 grams of fiber vs. the 3 grams in the “Whole-Grain” Muffins. Does that make them better even if they have enriched wheat flour? I don’t know specifically about the English Muffins, but some products add chicory root and other things to up the fiber content on the label, but our body doesn’t really process it like real fiber so it’s not worth it. My husband agreed to have me make this for Father’s Day this morning even though it has whole wheat flour–in his opinion nothing with whole wheat tastes good. He agreed that it was delicious! Not even “delicious for whole wheat”–just overall delicious! The whole-wheat oven pancake was fantastic . Substituted an organic peach for the pear. Thank you for the wonderful recipes. My husband loved this father’s day treat. I made this recipe this morning, and I don’t see why you can’t prep the fruit the night before as well as mix up the batter. You’ll probably just need to give the batter a good whisking before you use it as it may separate slightly. You can’t go wrong with this recipe! This. Was. Amazing! I was worried about switching up to white whole-wheat off the bat (5 and 2 year olds at home), so I did half white whole-wheat and half white flour, and also added 1/2 of a mashed banana to the batter. It turned out unbelievable!!! If this is what eating whole food is all about, I’m totally game! We’ve been working on our first week of real foods (as much as possible) and it has been utterly amazing how much better I feel and how much less we all eat! Thank you! Thank you! Thank you! for your amazing blog, Lisa. I link to your recipes all the time and have shared your site with family and friends to try to encourage them to at least eat MORE real foods (even if they aren’t ready to eliminate processed foods 100% — I figure baby steps are better than nothing!). Have you tried cast iron? It is all I use for skillets. Eggs taste so good in it and using a bit of butter they slide right out, same with veggies, meats everything. Thank you for your blog! I am enjoying exploring and looking forward to trying lots of recipes. I tried the Banana Pancakes with and without blueberries. They were so good. I want to use your menus too. I think they look kid friendly. My young children are picky eaters and used to processed food. One is hungry all the time. I think the Real food will help her so much. We have wanted to change our habits for a long time, but didn’t know where to start. Thank you! Found your blog (again) through a link on the Charlotteobserver.com. These pancakes are reminiscent of ones my mom made, just much healthier. I made them this morning for my kids and they were a hit – better than the unhealthy ones my mom used to make. Has anyone tried freezing this pancake? I would like any suggestions! My children are quirky with food, as so many are. We haven’t adopted a 100% whole food diet, but I have been enjoying finding foods they will eat! One of their quirks, is not liking cooked apples… Booo. I experimented with your recipe a bit today though and it turned out so yummy, I wanted to share with you! I left out all the sweet and spice… So just the eggs, wheat flour, and baking powder. Instead of fruit, I browned a pound of breakfast sausage. Crumbled bacon, or cubed ham would work too I would think. I sprinkled about half a cup of shredded cheddar over the sausage, and spread the pancake mix over the top. Cooked on the stove top and in the oven per your recipe. It’s a big hit! I also had a question, what are your thoughts on corn starch as a thickener? I want to make a chocolate pudding, but the only thickener I’ve ever used for that is corn starch. I saw your post about refined grains… Wild you use a substitute? Could you use a cake pan? This was SO DELICIOUS! I’m already thinking of other fruits that I could try this with. I can’t wait to make this again soon! We really enjoyed this, but eat it fast! After a couple days in the fridge, the bottom turned kind of black? I don’t think it could mold that quickly, so maybe it was from the apples turning brown or something. I didn’t sample to find out. But delicious when fresh! We had a similar dish at an organic restaurant in San Antonio Texas called Luke…they said it usually called for apples and pears but they used strawberries and a sweet cream topping along with some struesel type topping…it was so yummy! Cant wait to try this one at home! I was wondering if I can use my all clad 11 inch pan for the oven pancakes? Thankyou!! We started recipe in a cast iron skillet and then transferred to oven and it baked perfectly! We also topped with warm blueberries, yum. Fantastic recipe! 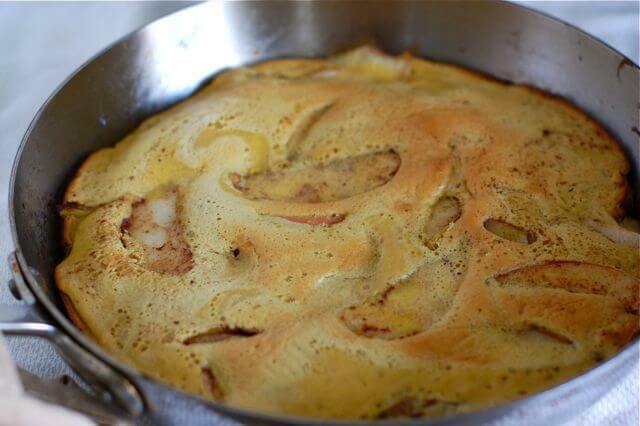 I love doing these german pancakes, although we don’t usually do it with fruit, we will have to try that! I LOVE Do Terra essential oils. I use them daily for just about everything. they are really amazing. Any kind of sickness, bump, bruise, burn, etc. there is an oil for it. I love that it is safe to use on my kids and you can even use it in your cooking! Delicious of course! It was perfect with over ripe pears! Why is the blender necessary? I found it was sort of messy. I need to get an immersion blender. Would it have worked for this? My 2yo has an egg allergy. Can an egg substitute be used? Any advice for dealing w/an egg allergy and cooking real food breakfasts? I made it this morning and it was really yummy! We didn’t even bother with syrup. My husband and five year old daughter ate it up quickly. My 3 year old (very picky eater) gagged when he tasted the fruit in it (he loves fresh fruit especially apples) so I think it was a texture issue for him. He ate around them and he liked the rest of it. I just fixed these to have for my daughter’s lunches. We taste tested an 1/8 pancake each and both give it a thumbs up! Delicious!!! I’m guessing we flash freeze prior to freezing a batch together!?! LOVE doTerra essential oils!!!! Peppermint for headaches, lavender to calm me, DigestZen is amazing, Frankincense for my muscle spasms, Deep blue for muscle pain. Lemon oil in my water!!!! Just can’t say enough about it. Looking forward to make this oven pancake. I want to top with Greek yogurt and berries!!! Just made for breakfast and it is so easy and delicious! I used my hand electric mixer instead of blender came out perfect! We had this for breakfast over the weekend. It was delicious. I cooked it a bit too long so it stuck to the pan a little, but it was totally my fault. It was still delicious. Also, we use doTERRA and really love their products. Is there a way to double this recipe? If I use a 14 inch cast iron pan? Would baking temp/time be the same? Thanks! Hi Kay. Sorry, we’ve not tried doubling this recipe. Yep, sounds like you cooked a little long or hot. An inch is a normal rise on these.